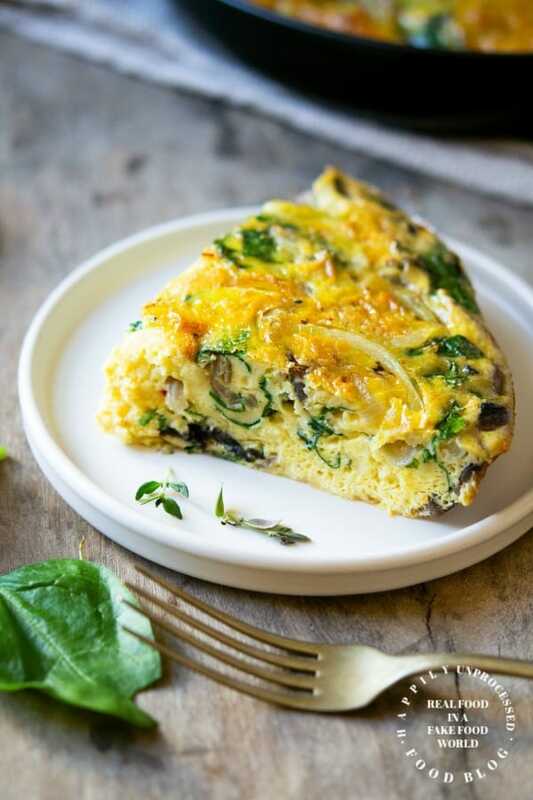 Frittatas are basically crustless quiches. They are light, fluffy and thick. 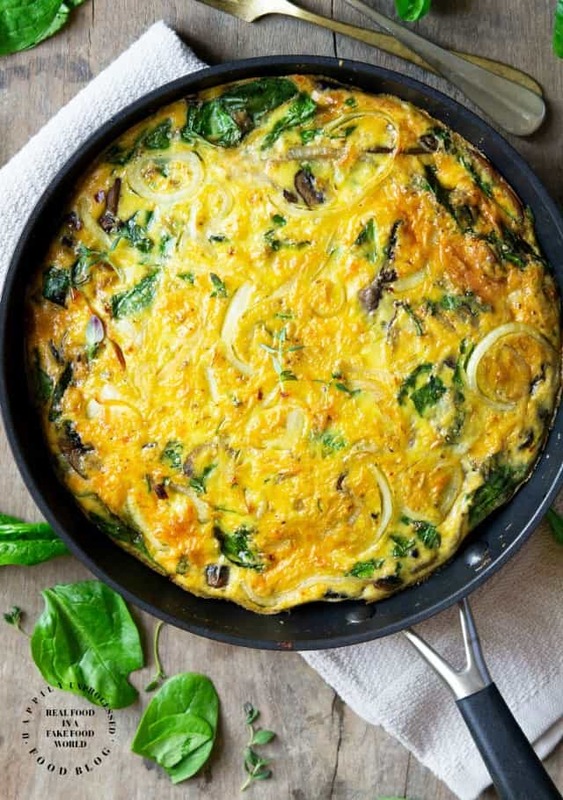 This frittata is full of caramelized onions, mushrooms, baby spinach and a generous amount of gruyere cheese to compliment it all. A well-made frittata is one of the most perfect foods. 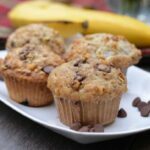 It’s cheap, easy to make, quick-cooking, and makes great use of any leftovers—not to mention it can be eaten for any meal ~ breakfast, lunch, and dinner. The problem is most people do not know how to make a great frittata. There are some key rules that need to be followed in order to get the right egg to milk ratio, density and height. Do you technically have to add dairy? No. But your frittata will be made infinitely better. You can use whole milk, half and half, sour cream, yogurt, or crème fraîche. But just be aware to use FULL FAT products and ORGANIC. No one likes a side of chemicals or rbGh in their eggs. Frittatas are pretty straight forward and easy enough for anyone to make. However, proportions are important in getting the right consistency for your frittata. For every dozen eggs you use, you’ll need a half-cup of dairy. Use too much dairy, and the eggs will be too loose and won’t bind. Use too little, and it will be all egg and very dense. As most of know, nothing compares to a well-seasoned cast-iron pan. However, I know not everyone has one or even wants one. You can use a small skillet, a pie plate or even a square 9×9 pan, but whatever you use make sure it is oven safe. Also, size DOES matter. 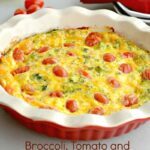 A 12 egg frittata comes out fantastic in a 10″ skillet. It gets enough bottom surface area to cook evenly as well as nice height. Anything bigger will make the frittata thinner and less majestic. A frittata is a great way to use up leftovers. I often have cooked mushrooms, onions, peppers, sausage etc. in my fridge at the end of the week. 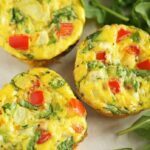 However there are times you may not have all these leftovers or just want to add something a little different to your frittata. If you do not pre-cook your veggies, especially the harder ones like onions, peppers etc., they will not get any softer after baking in the oven. They will retain some crunch. Precooking them in a small skillet with a little oil, adds some flavor as well as taking that unexpected rawness out of the veggies. You can also use this time to add a little spice to your frittata with some garlic, chili powder, cumin. It’s important to properly season your food to bring out its flavor. I personally use Sea Salt, not table salt, about a teaspoon. And fresh ground black pepper. 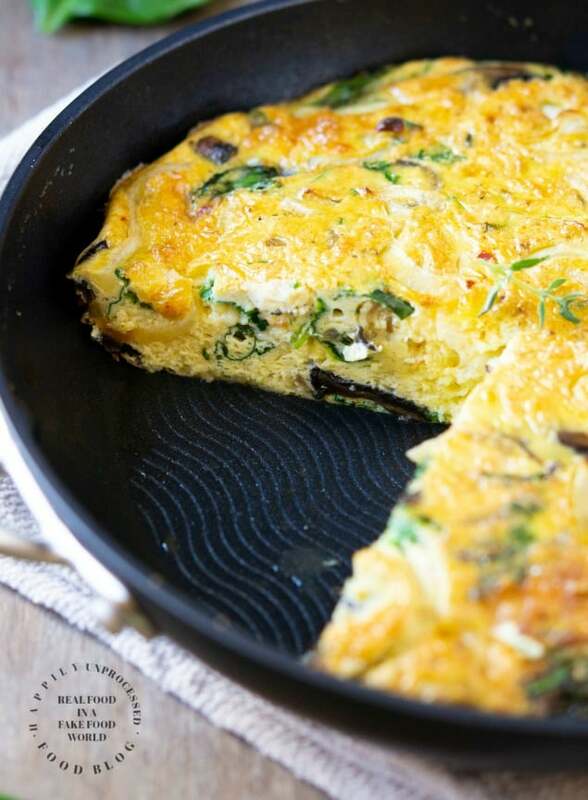 Once you have seasoned the eggs, whisk them vigorously to make lots of air bubbles so your frittata is light and airy. If you are wondering how to get your onions all the same size and how to cut it like a pro, I find this video from Rachel Ray very helpful . Slice the onion into thin strips and saute in a 10″ cast iron skillet along with 1 Tablespoon of oil and 1 Tablespoon of butter. Season generously with salt as it will help the onion sweat and caramelize. Allow to saute for 35-40 minutes until very tender, stirring frequently until a deep brown color is achieved. Set aside 1/4 cup of the onions. Add the sliced mushrooms and cook for an additional 5 minutes or until all the liquid has been released and evaporated. Add the chopped spinach to the skillet and cook for just a minute until spinach is tender. In large bowl, crack the eggs and add the cream or milk. Add 1 teaspoon of salt, 1/2 teaspoon pepper, paprika, thyme and oregano and red pepper flakes (if desired). Whisk well until eggs are frothy. Add the shredded cheese and stir to combine. Pour the egg mixture into cast iron skillet and top the frittata with the reserved onions. Carefully put the frittata in the preheated oven on the middle rack and bake for 22-25 minutes until middle is set but not overcooked. The frittata will continue to cook in the skillet when you take it out of the oven so do not overcook. 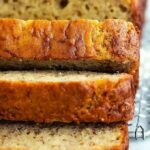 Allow to cool 10 minutes before serving. Top with sour cream, avocado or chives.